This article was previously published on the Young China Watchers’ blog and is reprinted here with kind permission. Young China Watchers is a global network of China-focused young professionals across nine chapter cities, engaging with the most pressing issues emerging from China today. In mid-July, the 18th EU-China Summit was held in Beijing. 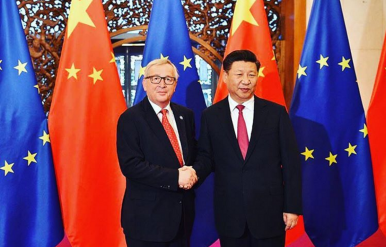 The summit convenes biannually, alternating between Brussels and Beijing, and guides the relationship between the EU and China at the highest level. The political event is accompanied by an EU-China Business Summit, underlining the importance of business and economic factors to these summits. Representatives of the EU Institutions as well as the Chinese government, such as Presidents Jean-Claude Juncker and Donald Tusk, as well as Premier Li Keqiang, attended the meeting and discussed issues on the EU-China agenda. Topics that currently dominate the agenda include the implications of the recent U.K. referendum on trade and investment relations, as well as the question of whether or not China should be granted Market Economy Status (MES) by the EU. The latter has been the subject of vigorous debates for the past months, with a decision due by the end of the year. As the EU-China Summit shapes further debate on the issue, it is time for an analysis of the arguments around MES. Taking into account the differences in trade relations between the individual EU member states and China, we argue that this question is largely a political one, despite being framed as a technical or economic issue. The significance of this question is undisputed. China is the EU’s second-largest trading partner after the United States, with a trade volume of €520 billion ($570 billion) in 2015. Its share of trade with the EU has more than doubled from 7 percent in 2002 to 15 percent in 2015. The current debate addresses two points: the definition of MES; and the implications of the expiry of Article 15 (a)(ii) of China’s accession protocol to the World Trade Organization (WTO). On the one hand, no universal definition for MES exists, as the example of Russia shows, and China’s accession protocol to the WTO does not explicitly mention MES. On the other hand, the importance of the expiry of this subparagraph lies in the WTO’s treatment of China in anti-dumping investigations after December 2016. Currently, the 52 anti-dumping measures in force cover a number of European industries, in particular steel, ceramics, and aluminum. These measures would have to follow different rules and stricter employment criteria once China is granted MES. EU decision-makers and institutions, however, are divided on how to cope with these issues. The most salient division can be found between the Member States. However, their positions cannot be explained by a purely economic analysis of their trade relations with China. Rather, the importance of Chinese economic diplomacy and positive long-term relationships need to be considered. For instance, Germany has a very strong manufacturing base and was, next to Finland, the only EU country with a trade surplus with China. Although many of its industries, such as steel, are very vocal in opposing MES for China, Chancellor Angela Merkel publicly positioned herself, in principle, in favor of China’s MES in October 2015. The U.K., having a larger trade deficit with China and a focus on Chinese FDI rather than trade, has traditionally been a strong advocate for trade liberalization and a supporter of China within the EU. Despite being in favor of granting China MES, Germany and the U.K. are potential losers in that scenario, according to a prominent study by the Economic Policy Institute (EPI). France and Italy, also cited as losers in the EPI study and running comparable trade deficits with China in absolute terms to the U.K., come to different conclusions. France, with a trade deficit vis-a-vis China of around €10 billion and exporting less than a third of Germany’s volume, has refrained from taking a position on China’s MES. Finally, Italy, running a trade deficit vis-a-vis China of around €18 billion, strongly opposes granting China MES. Taking into account the EU’s cumulative trade relationships is therefore insufficient. Instead, Germany and the U.K.’s efforts in promoting a long-term strategy towards China, combining bilateral trade, investments, and long-term positive economic relations, seem to play a significant role. Further frictions exist between the European Institutions themselves. There is consensus that China does not fulfill the five relevant EU criteria for MES, and by now, there also seems to be a consensus that the expiration of subparagraph (a)(ii) does not result in an automatic granting of MES to China. However, it remains to be seen if and how the EU will: a) grant MES to China; and b) modernize its trade defense legislation in order to protect its industries from Chinese dumping. At the EU-China Summit in Beijing, Juncker explicitly linked China’s overcapacities in steel production to the question of MES. Whereas the Commission’s legal service issued an internal analysis that suggested China should be granted MES, the European Parliament recently issued a non-legislative resolution calling for China to fulfill the five criteria for MES and thereby denying any automatic applicability by December 2016. China has been pursuing MES predominantly on a legal basis, relying almost exclusively on its WTO accession protocol. Since EU member states are divided, the December 2016 deadline raises the question of what strategies China might pursue. To date, China has pursued four approaches. Under EU law, China cooperated in investigations that assessed its progress toward obtaining MES in 2004, 2008, 2010, and 2011, after which China ceased to cooperate. Second, Premier Wen Jiabao publicly mentioned in September 2011 that the EU could grant China early MES in exchange for further support in bailing out the European economy. However, President Xi Jinping has been more reserved. Third, at a WTO meeting in late 2015, China warned that it would take WTO action against countries that refuse to acknowledge China as a market economy after December 2016. Finally, in pursuing its goal, the Chinese approach seems to be centered on lobbying rather than a negotiation process. Some Europeans fear that China will retaliate if it does not get MES. China pledged to contribute to the European Fund for Strategic Investments (EFSI) and is currently deliberating the size of its contribution. It could use this as leverage to pressure the Commission to propose granting MES. Second, China could close further parts of its domestic market to foreign competition or enact anti-competitive measures to the same effect. Third, China could employ selective pressure — against specific industries, individual governments, or by using its investments in European companies — to force targets to lobby on its behalf. Although these are only options, the second and third approaches contradict WTO law and go against the spirit of international economic cooperation. It is not in China’s interest to retaliate or exert pressure on the EU. Contrary to the infamous solar panels case in 2012, in which China launched investigations into European products, MES concerns many industries and involves the entire EU. Where would it begin or end? Given that 1.38 percent of EU imports from China are subject to anti-dumping, the potential costs of deploying economic pressure across the continent would far outstrip the gains of MES, damaging EU-China relations in the process. Second, since joining the WTO, China’s overall trade has soared despite its non-market economy (NME) status, indicating that MES is not an acute issue for China. Third, retaliatory moves by China would further undermine European investors’ confidence in China in the midst of its economic slowdown. Considering the above, neither economic nor legal arguments give a clear indication of whether China should be granted MES in December 2016 and the probability of China retaliating — resulting in a “trade war” — remains low. Hence, the decision is particularly political when it comes to weighing the possible consequences of the overall relationship of EU states with China and other important partners. After all, economic diplomacy is China’s trademark for engaging with the international community. To what extent the EU understands the importance of this Chinese trait and factors it into its decision-making processes remains to be seen. There are however several aspects that weigh upon the EU’s decision. First, the indecisiveness of the EU Institutions might have grave consequences for the outcome of the decision. Making use of existing cleavages, China’s lobbying of individual member states is much more effective if there is no clear position from Brussels. Second, the debate reflects more general difficulties in EU decision-making, especially regarding community competences. Third, the decision taken by the EU will send a message about its reliability and legal compliance in international regimes. All of this will inform and impact the relationship of the EU with its partners. While denying China MES may negatively impact the negotiations for the EU-China Bilateral Investment Treaty, granting MES may provoke discontent among other trading partners with whom the EU is currently negotiating agreements, such as the US or Japan. Currently, the Commission is finalizing an impact assessment and expected to present a formal proposal by September 2016. Not long after is the key date of 11 December, with tensions sure to increase ahead of the final decision. This article is based on “Economics, Law and Politics: The Divisive Question of China’s Market Economy Status” by Insa Ewert, Maurice Fermont, and Jan Philipp Pöter, published in the EU-China Observer 1/2016. Post-Brexit UK-China Relations: Impact on the USChina Defends Market Economy Hopes After EU CondemnationChina-EU Relations: Crisis and OpportunityChina's Big Week for European DiplomacyIs Europe Finally Rising to the China Challenge?